Ik heb net trouwens geprobeerd om een hotel te boeken in Cardif........ alles vol!! Nu vlieg ik op 22 augustus 's ochtends om 10.20 uur heen en op 23 augustus al om 6 uur 's ochtends terug. zijn er niet zoveel hotels/hostels of B&B in cardiff?? lekker stukkie wezen toeren met levi samen...dak naar beneden, stoelverwarming aan, gewone verwarming aan..ging best! Gaat uitstekende met Ziggo, geen klachten meer de afgelopen maanden. Zie dan ook geen noodzaak om over te stappen, ben zelfs tevreden! beter dan regen lijkt me....!? UpStairs on the Square proprietresses Mary-Catherine Deibel, left, and Deborah Hughes, right, pose with U2's Bono and his margarita at the after-party held at their HarvardSquare eatery. de top van de Amsterdam ArenA 78 meter hoog is? Ah, gefeliciteerd Juul. Wat is nu je nieuwe toptijd? Just two minutes into an interview with artist Hiroshi Sugimoto, it became clear why the famously discreet 61-year-old had agreed to talk about rock bandU2's use of one of his photographs on the cover of their latest album, "No Line on the Horizon." "The first thing I want you to let people know," he said, seated in an office at Ginza's Gallery Koyanagi, "is there is no commercial aspectto my relation with U2. No cash is involved." No cash? Sugimoto's 1993 image of the Boden Sea at Uttwil adorns not only the cover of the album that debuted this month at No. 1 in almost 30 countries,but is also plastered over buses, taxis and TV ads worldwide as part of a multimillion dollar advertising blitz. The commercial connection had seemed soobvious that many assumed Sugimoto had sold out. "People thought that I was in some sort of financial trouble," chuckled Sugimoto, who has always had a reputation for refusing requests to use hiswork in merchandise or advertising. Others suggested he'd been corrupted by the megarich U2. According to The Guardian's Web site, electronic-music artist Taylor Deupree, who created a CDwith Richard Chartier for a Sugimoto retrospective at the Hirshhorn Museum in Washington, D.C. in 2006, dismissed the U2 cover saying that for Bono and crew,"it's simply a phone call and a check." Deupree also accused the band of copying the design of their album. Both covers use the same "Boden Sea" image (which was actually taken at LakeConstance in Switzerland and is just one of over 200 photographs that make up the artist's "Seascapes" series). Apparently Deupree is wrong on both counts. Noting that the choice of the same photograph was just a "coincidence," Sugimoto explained that he wasfirst introduced to Bono during a visit with an art collector in France about four years ago. "I was taken by private jet to this beautiful villa in Nice," he explained. "When we got there, this guy, rather short - OK, my size - waswelcoming me. I thought, 'He looks familiar.' " Although not impartial to rock music, Sugimoto wasn't really familiar with U2's work. "I was part of the Beatles generation," he said. "I still have Pink Floyd's 'The Dark Side of the Moon' playing in my car!" Bono confessed that he loved Sugimoto's seascape photographs and began quizzing the artist about the work. "He started taking notes as I talked," Sugimoto recalled. Those notes became the foundation for the new album's title track. Last year, during avisit to Dublin, Sugimoto heard the first demo tape, and a few months later was told by Bono that U2 wanted to use the Boden Sea image on the album jacket. "I said, 'Are you sure? 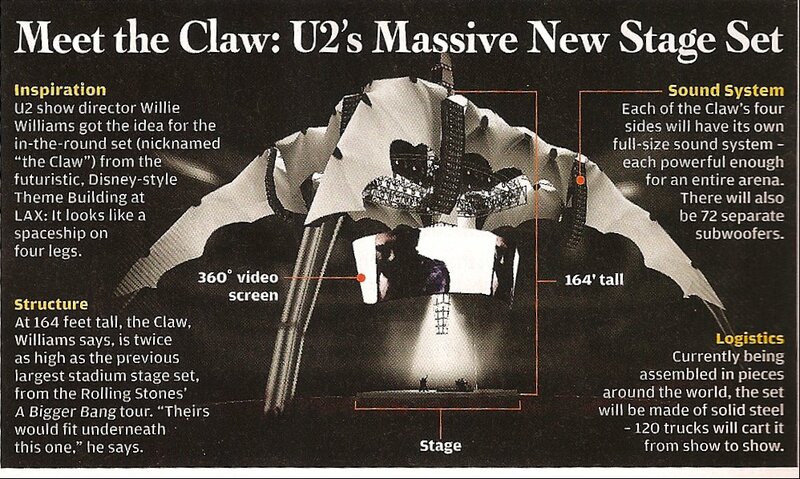 If you use it you won't be able to put anything on top of it, not even the U2 name," the artist remembered. He was surprised when Bono strongly agreed. Rolling Stone is now calling the text-free jacket "an early front runner for album cover of the year. "(The cover also features an equal sign, but it is attached to the plastic wrapper, so it disappears once opened it.) Then came talk of money. "I gave myself just a second to think about it," Sugimoto recalled, "and I said 'How about a Stone Age deal - no cash?' "
Bono agreed on an "artist-to-artist" barter whereby Sugimoto could use the "No Line on the Horizon" song in any project he wanted in thefuture. Sugimoto says he still hasn't made up his mind about how to use the song - which he says he likes, but liked even better in its "more hardrock" demo stage. "Maybe I'll use it in some video-art project, or charity project," he said. Is he happy with the way the album cover looks? "The boxededitions of the album are printed well," he noted. But, he was resigned to the impossibility of proper quality control when they "print them all overthe world." Still, Sugimoto is satisfied that his photographs have struck a chord with so many people. "That's the effect of seascapes," he said, before explaining that a view of a boatless ocean is one of the only things left in the world that wecan experience in the same way that our primitive ancestors would have experienced millenniums ago. "The works are really connected to the very deep rootsof the human mind," he said. "Even to the minds of musicians who have reached the pinnacle of success." Zo Juul, dat is een uitstekende tijd. Ik kan me voorstellen dat je nu een paar biertjes wegtikt !! vind het sowieso super van je juul!!! gefeliciteerd met je prestatie!!! Servicekosten (incl. BTW)Waarom? Waarom servicekosten? Gefeliciteerd Juul! Knap gedaan hoor! eet smakelijk voor straks allemaal!! vanavond sambal goreng boontjes op het menu, met (gemarineerde) gebakken spek en rijst..